Being Retro: Going to 3D... Put on Your Glasses Now! Lots to tell you, so I thought I would share it with you today on Sunday... Yeah I know Sunday, but tomorrow begins the "A to Z" Challenge where you can sign up for it. All the rules, all the fun and all the great people we be there... will you, you should.... all the cool people are. So get your glasses on... be amazed! Second thing, you may not know this... last year I got the pleasure to interview the group "The Blanks" and it turned out to be a very cool friendship with them. I got the chance to help them out on a few projects from doing the layout for their last Cd and a few designs for T-shirts [sample below]. You can find out more about them and the things I did over at "TWO THUMBS" my review site. Also you can find out more of my new site where I have started covering more score/soundtrack music. I will be doing more interviews with those folks I think you all should know and crossed fingers that I can bring more talented composers. 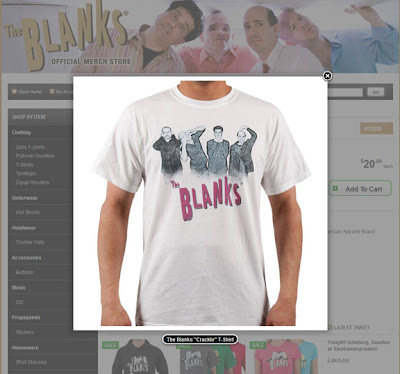 This is from "The Blanks" merchandise site... I even got the name of the shirt "Crackle"... for me it was a cool thing! Ps. Chuck vs the Show End. So NBC's Chuck ended on Friday night, it was very sad and disappointing for fans... most of all the lead characters Chuck and Sarah. If you don't watch, don't worry my advice is to skip all of the Season 5 and watch Seasons 1 to 4... trust me. That is so awesome! Now when you see the t-shirt or CD you can smile and think "I did that." Ah! Thanks for reminding me, I meant to watch the Chuck season finale... just to get that show over with, haha. hey now... with the way it ended, it can't be over! Remember I am for hire... wink! Very sad to hear Chuck will end, we're a bit behind in Australia, and we don't have the latest episode of Chuck yet. Have dutifully signed up for A-Z (or as I like to call it; Apocalypse to Zombies). Love the blog, what's not to like about the festering undead? The Chuck stops on Season 4... the 5th was not worth mentioning.